Welcome to Will's Magic Pixel Particle Effects! I'm Will... Nice to meet you! This pack includes 20 high quality pixel art particle effect animations. Are you ready to add some magic to your game? UPDATE: Now includes the raw particles used to create the effects! 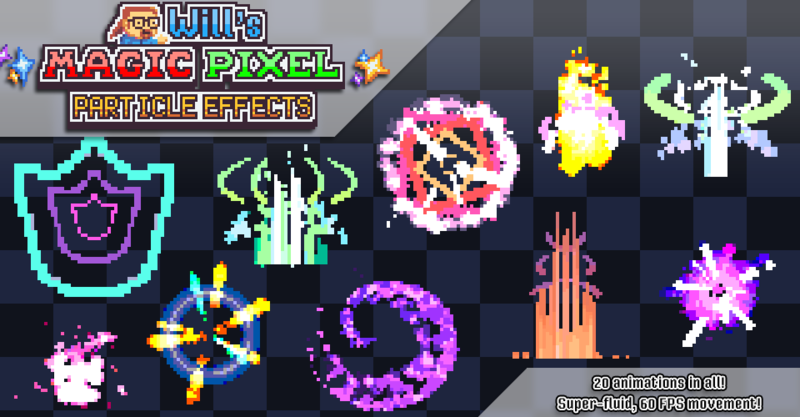 Will's Magic Particle Effects is the non-pixel art counterpart to this asset pack! It includes 20 high-quality, 60 FPS effects, at a higher resolution of 150x150. Some of them are based on the effects in this pack, and some of them are totally new... But ALL of them are awesome! Head on over and check it out! What program you used to make these animations ? This is relly beautiful! I wanted to know if I buy them, can I use them in a Commercial game, if so, what are the requirements. Thanks in advance. Thank you, it is very kind of you to use this license. I really appreciate it, keep up the awesome work! These are awesome, but I was expecting it to include the smallest, most basic "particle" pieces. I'm concerned that having these as sprite sheets takes up too much space on my texture page. Are you able to add the tiniest pieces for each effect so I can program the particle systems with them myself? Hi Bitlather, I can do that! I've added the basic particles in a folder called raw_particles. If you re-download the zip file you should see it in there. I hope you're able to create the effect you want with them. Many of the animations were rendered at a higher resolution and then downsampled to get a more "pixel" effect, so a few of the particles are actually a little large. The most useful ones in there are the rainbow particles, beam particle, and the cloud particle. Since the cloud particle was one of the larger ones, I've included a downsampled 16x16 version of it as well. Of course all the heart/star/diamond/etc particles are pretty useful too, I think. Downloaded the raw particles - thanks a lot! In GameMaker, the engine I use, it's easy enough to delete frames, so I don't think you need to take that on yourself. I just like the randomness and compactness that you get with your own particle system over sprites. I'm looking forward to playing with these - might take a few weeks to get to resolve all my current to-dos, but this looks like an excellent pack.